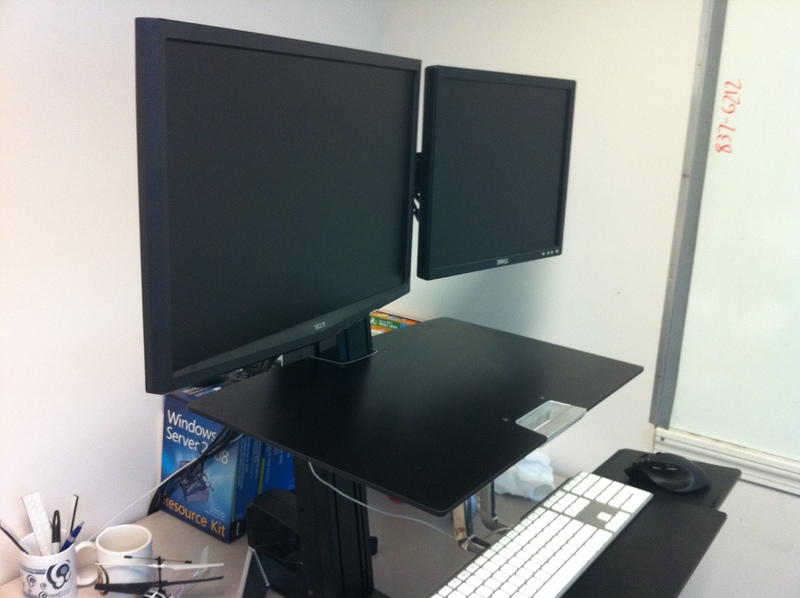 In 2010, I reviewed the ErgoTron WorkFit-S sit-stand workstation. Last month, I posted a follow up with how I’ve fared with the equipment over the last year. One of the issues I mentioned related specifically to workflow efficiency when using the product: by itself, it can be difficult to perform tasks that involve anything other than your keyboard, mouse, and display. Well, there must have been a little bird watching me attempt to clamp my iPad to the keyboard arm to do some studying one day, or reading my mind whenever I had to access some item from my desktop periodically, because accessories were released not long afterward that addressed these exact situations. Enter the Tablet Holder and Work Surface accessories. Last September, I reviewed some equipment designed to get desk-bound working stiffs up off their keisters and moving around a little. At the time, due mostly to office configuration, my place of employment wasn’t comfortable with me using it and I had no choice but to sourly bring it home.